﻿ Hindsight Sportfishing introduces the "20/20"
New for 2018 - the "20/20"
Hindsight Sportfishing is proud to announce the addition of the "20/20" to the fleet, starting with the 2018 season. 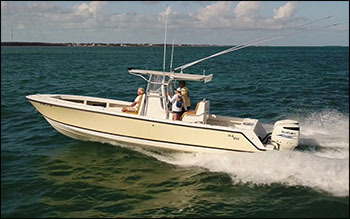 The "20/20" is a 32' SeaVee center console powered by twin 300 h.p. Suzuki outboards. The "20/20" is big, fast, and first class, in every sense of the word. Able to reach the fish in a hurry, the "20/20" opens up avenues of opportunity that the Hindsight alone can't pursue. Perfect for smaller groups, the "20/20" is ideal for chasing stripers off Provincetown, down off Brewster, or "running and gunning" for small bluefin all over Cape Cod. 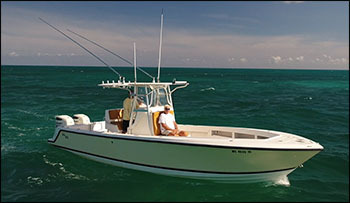 The "20/20" will be available out of Rock Harbor from May through October for bass, bluefish, and tuna. During the winter months of January through April, the "20/20" will be available for charter out of the Florida Keys for sailfish, swordfish, king mackerel, mahi, and marlin. In addition to the many fishing opportunities that the "20/20" affords, Hindsight Sportfishing will now be able to offer the following experiences. The "20/20" is fully equipped with the latest electronics and safety gear, as well as a full compliment of the highest quality rods, reels, and tackle that money can buy. For a truly customizable experience that you will never forget, contact Capt. Brett Wilson for more information.